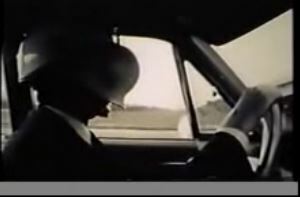 By deliberately blinding himself on and off to study driver distractions, a researcher in 1963 took research to a new level while driving on a Boston highway. This mid-20th century experiment seems to anticipate one of the 21st century’s most dangerous driving issues. This is basically the same thing experienced by a driver while texting. Note while watching; traffic in 1963 on what would eventually become I-95, is far less than what it is today. It was risky back then and it would be considered criminal to try such an experiment today.